As turning pages of page a day calendar, 11th March is coming again. Recently, I hear the news about the people who re-started their clock once stopped since the Great East Japan Earthquake. And they are challenging to open a door leading happiness for others. Last month, I received a parcel from a friend living in Tohoku area. I found red, shiny, beautiful, and very, very big strawberries in the box. I could smell berries even before I open it. There were nine strawberries lying on cushioning material. The strawberry is a rare kind and difficult to grow. Only one farmer is growing it successfully. Each wrap the strawberry is gently wrapped and one by one is shipped out all over Japan with senders compliment by only one fruit shop. The nine strawberries sent from Tohoku brought “Happiness” for nine people. Every person who ate a strawberry was filled with joy from the mouth to the heart. Gentle care by the farmer, good-wishes of gift-giver and passion of the fruit shop, everything was put in the strawberries. And it brought our happiest smiles. “Arigato” for the fruit shop. And, “Arigato” for my friend. There are many TV programs and articles on newspapers toward 11th March. Beside them, I ask myself if I am ready for any disaster/incidents. It could be happened anywhere and anytime. The preparation is not only to build stockpile and disaster kit. That is if I can make immediate decision, if I can be creative using limited devices, if I can bear the loneliness… They are all in line with the energy to live and wisdom to live. What kind of action will I take on the emergency situation? What can I do? I may only know the answer when it happens. But, it is sure everything is based on the daily life. The consciousness we have in the daily life will lead appropriate action at each situation. “Be Prepared” is the words always in the mind of those who have been involved in Girl Scouting and Boy Scouting. Now, I reflect on the profound meaning of the words again. 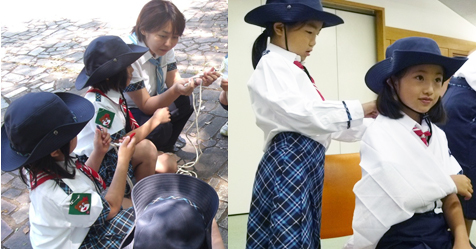 Girl Scouts of Japan institutes “KIZUNA Day” Mar.11 as “Remember Mar.11” from 2014. It would be an opportunity to be aware of “Be Prepared,Girl Scout Motto,” and prepare for earthquake and disaster prevention through the Girl Scouting in March.